Pipe Jacking Machine Slurry Separation System,Pipe Jacking Machine mud Separation System,Pipe Jacking Machine mud treatment equipment. (1) pipe jacking machine, the main cylinder, mud water circulation system and mud separation equipment package. (2) with the eccentric rotary cone crusher of the spoke-type cutter, can be broken outside the top of the pipe 30%, a shaft compression strength of 196MPa (196000KN / ㎡) pebbles and gravel. (3) pipe jacking to adapt to the formation of a wide range of conditions. Such as clay, gravel and gravel mixed pebbles and soft rock soil. In unstable strata, such as gravel soils, the stability of the ground can be maintained by maintaining the soil pressure of the tapered eccentric crusher. (4) the use of the main cylinder installed in the track, a jacking can be more than 100m in length. (5) pipe jacking machine from the ground can be a remote operation. (6) on the console will be able to complete the TV monitoring and direction control. To maintain high accuracy. (7) the use of the main cylinder can be a top end of a pipeline without interruption. (8) The mud separation unit is a flexible, sealed separation system that saves installation space. 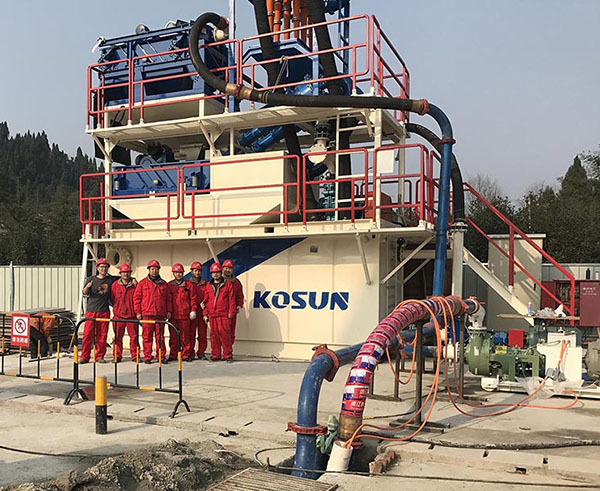 Kosun to carry out scientific and technological innovation, improve the pipe jacking mud management system separation to solve the separation of ultra-fine particles of soil problems. Through the separation of mud, the water can be reused after treatment to ensure zero emissions, zero leakage, zero pollution, and effectively green construction. “This section of the chief engineer Xu Weiging introduced. “To separate the mud, as if to sesame paste in the sesame seeds and water separated.” 13 section of the party secretary of the party secretary Lan Hongbin said that large particles can be separated with sieve, and the remaining “sesame paste” In the “sesame” to be separated, it becomes a problem. After years of exploration and experimentation, Kosun summed up a set of sieves, swirling, pressure filtration, centrifugation and auxiliary agents of the method, the successful realization of the mud shield solid-liquid separation, separation of the dregs transported to a special storage Transport places, the water is recycled. Pipe jacking machine slurry system main function is to provide a pressure mud for the face of the pipe jacking pipe to establish the mud slurry, while the pipe cutting machine can be cut down from the continuous Constantly transported to the ground, and the separation of soil and mud treatment. Pipe jacking machine slurry system is an important part of pipe jacking construction. The pipe jacking construction is an underground pipe construction method developed after the construction of the shield. It does not require excavation of the surface layer and can cross roads, railways, rivers, ground buildings, underground structures and various underground pipelines. 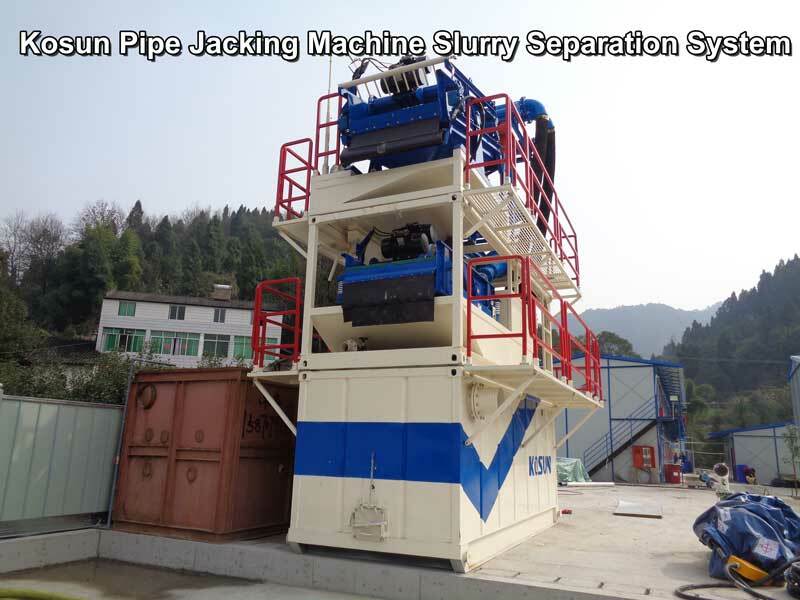 Pipe jacking machine slurry separation system is an important part of pipe jacking construction. Pipe jacking Construction The tool tube or boring machine is lifted from the working well through the soil to the receiving shaft by means of thrust between the main cylinder and the inter-pipe interchanges. At the same time, it is followed by the tool tube or boring machine after the pipeline buried in the two wells, in order to achieve the construction of non-excavated underground pipeline construction methods. The most prominent feature of pipe jacking construction is the adaptability problem. For different geological conditions, construction conditions and design requirements, the choice of the application of the pipe jacking with the need to match the appropriate pipe jacking pipe system. How to correctly select the pipe jacking machine mud management system and supporting auxiliary equipment for the pipe jacking construction is very critical. We make every effort to enable customers to get more benefits, and in the market to seek more business opportunities. We are committed to creating more value for you and society. We must develop new technologies and new products for our customers at a high level in this field; we must strengthen our position and set an example. A group of experienced staff ready to serve you! 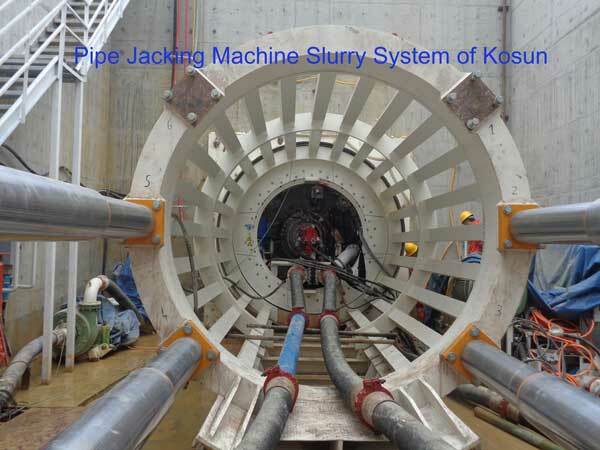 Pipe Jacking Machines Mud Treatment by Kosun manufacturer with more than 20 years experience. 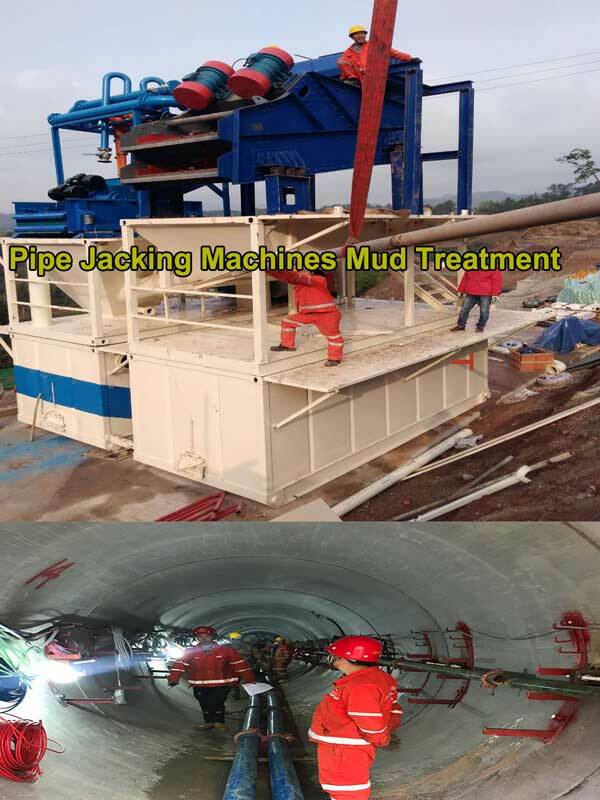 The selection of the pipe jacking method should be selected according to the actual situation of the terrain, engineering and hydrogeology, traffic conditions, ground buildings, underground pipelines and the presence of underground obstructions along the construction and the requirements for surface deformation control , Must ensure that the safety, to ensure quality, affordable, land conservation, pipe jacking machine construction mud treatment. The construction sequence of the pipe jacking should be considered from the whole drainage system. The pipe treatment of the pipe jacking machine should start from the downstream, and the construction condition should be better when the initial excavation section is carried out. 1,pipe jacking machine, crushing treatment integration, without any auxiliary technology. 2, the machine bypass device standardization, greatly reducing the installation time and prevent mud pipe obstruction. 3, laser reflection type direction induction device can make the operation simple and accurate. 4, for a wide range of soil, pipe a long distance. 5, the water quality requirements are low, mud water after the separation of mud can be recycled. 6, water mixing soil through the pipeline into the purification pool, the entire pipeline to keep dry, easy to check the construction. 7, pipe head using mechanical excavation, effective to prevent landslides, gushing water, sand and harmful gases. The technical risk is less and the top and the necessary field technical data testing and analysis work in order to understand the actual soil under the ground to adapt to the construction environment, to master the operation of the pipe jacking equipment, reasonable organization of the operator, through the initial excavation section of the jacking summary, further Adjust the construction of technical parameters, optimize the next step pipe construction process. All the pipe jacking equipment must be repaired, pipe jacking machine mud treatment after passing the inspection before being transported into the construction site. In the work of the pit must be installed when the single machine and the whole linkage debugging, in the jacking must implement a routine maintenance system. Pipe Jacking Machine Mud System is mainly composed of mud vibrating screen, desanding cyclone combination, demisting cyclone combination, gravel pump and electric control system. In the pipe treatment of the pipe jacking, the pipe jacking system of the pipe jacking machine is responsible for the separation of the mud from the mud pipe during the tunneling process. Can greatly improve the site of mud water treatment efficiency and construction progress. 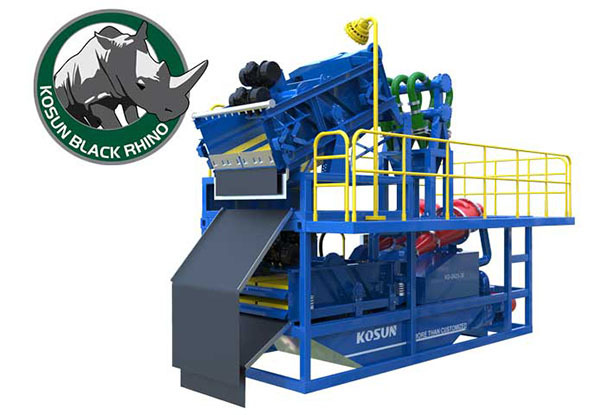 At present, there are many domestic manufacturers of mud separation system, but the actual application of the equipment is less, and Kosun machinery as the leading domestic 25 years of rich experience in the production of well-known pipe jacking machine slurry separation system equipment manufacturers, pipe jacking mud system, mud treatment equipment R & D production is very mature, many mud separation system exported to foreign countries. In the field of micro shield, pipe jacking construction, continuous wall construction, urban construction piling, river dredging, environmental protection and other fields, can produce different specifications of the amount of mud separation system equipment used to support different caliber miniature shield machine, pipe jacking machine , Rotary drilling rigs and so on. In the pipe jacking pipe system production process, from the design R & D production test machine, and other links, close communication with customers, strict checks to ensure product quality; Kosun mechanical pipe jacking mud system equipment, people-oriented, user-friendly design, Pay attention to workers’ safe operation, system design escalators and other safety measures. Pipe Jacking Machine Mud System of Kosun is well recognized by clients all over the world owning to its high quality and best after sale service. Pipe Jacking Machine Slurry Separation System main function is to provide a pressure mud for the face of the pipe jacking pipe to establish the mud slurry, while the pipe cutting machine can be cut down from the continuous Constantly transported to the ground, and the separation of soil and mud treatment. Pipe Jacking Machine Slurry System is an important part of pipe jacking construction. The pipe jacking construction is an underground pipe construction method developed after the construction of the shield. It does not require excavation of the surface layer and can cross roads, railways, rivers, ground buildings, underground structures and various underground pipelines. Pipe sprinkler mud system is an important part of pipe jacking construction. Pipe jacking Construction tool tube or boring machine is lifted from the working well through the soil to the receiving shaft by means of thrust between the main cylinder and the inter-pipe interchanges. At the same time, it is followed by the tool tube or boring machine after the pipeline buried in the two wells, in order to achieve the construction of non-excavated underground pipeline construction methods. The most prominent feature of pipe jacking construction is the adaptability problem. For different geological conditions, construction conditions and design requirements, the choice of the application of the pipe jacking with the need to match the appropriate pipe jacking pipe system How to correctly select the pipe jacking machine and supporting auxiliary equipment for the pipe jacking construction Is very critical. According to customer demand, Kosun will be based on the actual needs of customers, customers recommend the most suitable products for customers to provide reliable, high-quality products. Kosun will be dedicated to domestic and foreign customers with strong technical strength and improve after-sales service system. Coase looks forward to working with you for consultation and cooperation! Kosun is confident in providing more cost-effective equipment and mud systems in 2017. Pipe jacking Machine system of the pipe jacking machine is responsible for the separation of the mud from the mud pipe during the tunneling process. Can greatly improve the site of mud water treatment efficiency and construction progress. The mud produced in the construction of the pipe jacking is specially treated, and the pipe jacking machine system can be understood as a mud separation system for supporting the mud for the pipe jacking machine. At present, there are many domestic manufacturers of mud separation system, but the actual application of the equipment is less, and Kosun as the leading domestic 25 years of rich experience in the production of well-known TBM slurry separation system equipment manufacturers, pipe jacking machine mud management system, mud treatment equipment R & D production is very mature, many mud separation system exported to foreign countries. In the pipe jacking pipe system production process, from the design R & D production test machine, and other links, close communication with customers, strict checks to ensure product quality; Branch Xun mechanical pipe jacking mud system equipment, people-oriented, user-friendly design, Pay attention to workers’ safe operation, system design escalators and other safety measures. Pipe jacking machine mud system got well recognized by clients because of its high quality and best after service sales all over the world. Welcome to contact us if you need any help. Pipe Jacking Machine Mud Management System method should be selected according to the actual situation of the terrain, engineering and hydrogeology, traffic conditions, ground buildings, underground pipelines and the presence of underground obstructions along the construction and the requirements for surface deformation control , Must ensure that the safety, to ensure quality, affordable, land conservation, pipe jacking machine construction mud treatment. The mud treatment equipment is a mud purification treatment machine developed for the construction mud, the bridge pile foundation project, the underground tunnel shield engineering and the non-excavation construction. 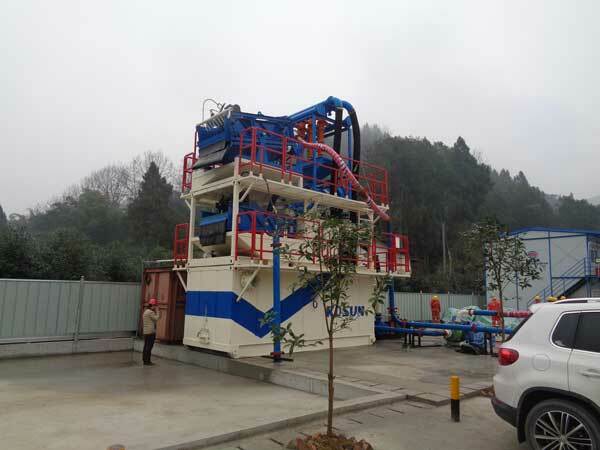 It can effectively control the slurry quality of the construction mud, solid-liquid separation of the solid particles in the mud, improve the pile formation rate, reduce the amount of bentonite to reduce the cost of pulp. Can realize the environmental transportation and slurry discharge of the sludge residue, and meet the on-site requirements of the environmental protection construction. 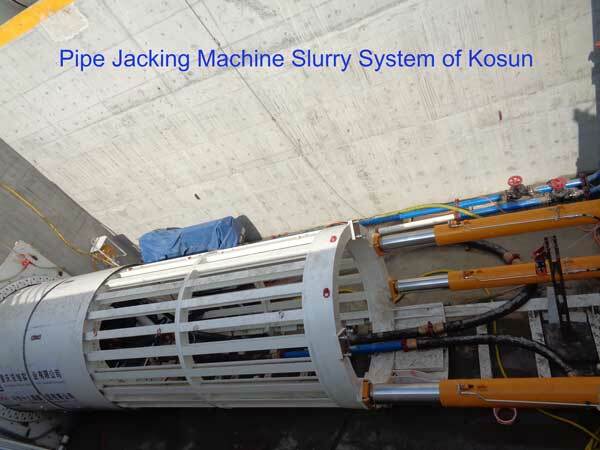 Pipe jacking machines separation units by Kosun treat water before it goes to drains and to the environment. Though lots of efforts are taken to establish more plants, even more are needed. Water is our renewable resource but is slowly being squandered. Pipe jacking machines separation units is one way to recycle waste water. People have now started to raise voice to oil companies about waste water and fracking. Even the rules have changed, in terms of effects on this slurry on environment. Thus pipe jacking machines separation units is must to have with oil and construction companies, other options like Mixing and Grouting Plants, mine tailings treatment stations also needed. It requires huge efforts in this area and very much needed to happen and fast.In some instances, Water Recycling has become relatively so easy that with just takes a filtration system to take out solids from the wastewater. One model is in the automotive industry, to clean the model shells, a paint-shop wash-water isused and the vast majority of this waste water was of relatively consumable quality. With minimal filtration treatment can be reused. Like Scandinavia, great technology leaps are needed to make to recycle waste water and convert them resource to create energy. We need to lesson from Sweden who ran out of waste and is now in need to import waste to create energy. They dump less than 1 % of waste and their water filtration techniques is so advanced that water can also be potable. This has set a great example or a model for us to step to innovation in an environmental capacity. And Sweden isn’t in different era than rest of other. The recycling (by Pipe jacking machines separation plants) of the slurry has now become a great option in a way to eradicate scarcity of water. We are on down slide of the slope in water conservation with great developments and increasing populations. Considering these facts, with some open mindedness, innovative thinking and waste water treatment methods we can contribute to make some needed changes in the world.